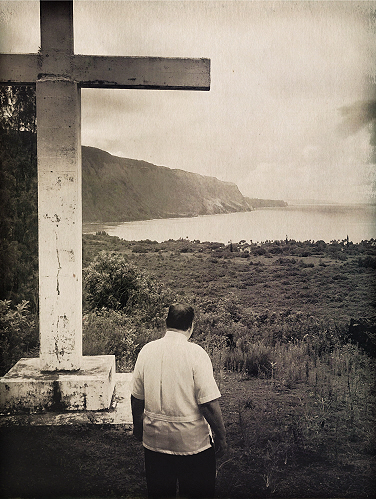 Father William F. Petrie, sscc, looking over Kalaupapa Settlement from the cross atop the Kauhako crater. Bill Petrie is a priest with the Congregation of the Sacred Hearts of Jesus and Mary — the same order as St. Damien. With Mother Marianne Cope, the Sisters of St. Francis of Syracuse and volunteer Joseph Dutton, Damien brought the love of God and dignity to Hansen’s disease patients exiled at Kalaupapa. Inspired by the life of St. Damien, Father Bill worked 25 years in India with Mother Teresa of Calcutta, helping the poorest of the poor and many who were afflicted with Hansen’s disease. Now he serves as Pastor of St. Damien Church on Moloka‘i and supports Catholic ministry to the last Hansen’s disease patients in Hawai‘i. 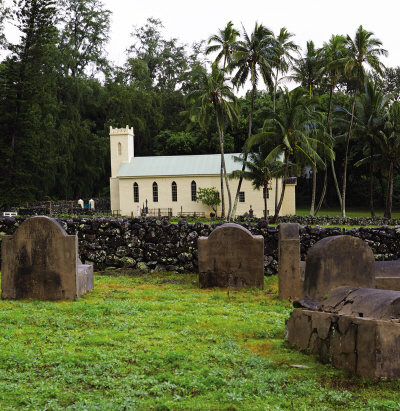 Many seniors and baby boomers returning to the church and looking for the God of their youth, are inspired by the story of Damien’s love for God and the patients of Kalaupapa. Faith, hope and love help us face uncertainties at the end of life. 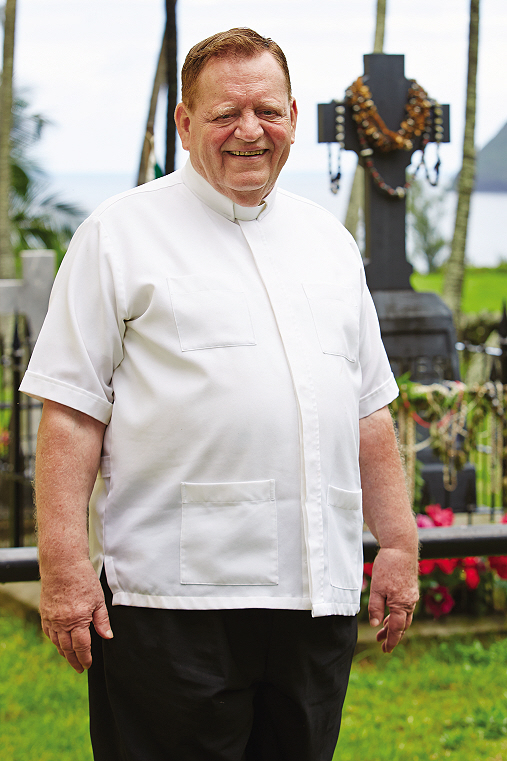 Father Bill’s joy and enthusiasm are infectious and people want to be around him — like St. Damien won the hearts of patients in Kalaupapa. So we asked Father Bill to share his wisdom on new beginnings — the transitions of life. His counsel is simple: change will come, so embrace closure and take time to prepare for the next step on your path. His kind, humble words offer a quiet oasis amid the chaos of our boisterous world. Take a few moments to hear what father Bill learned from the joy, peace and love of Mother Teresa and Saint Damien. Without realizing it, we face many new beginnings in our lives, some small and others life changing events. One such new beginning was my being inspired to become a Catholic priest after reading the life of Father Damien of Moloka‘i, a vision so profound that it was to lead me to work with Mother Teresa of Calcutta helping Hansen’s disease patients in India. I started by writing a letter. Mother Teresa didn’t answer, so I sent a second note with a $250 donation, for her work with the poorest of the poor. Again, no response. Then my superiors gave me permission to visit India, so I wrote her again, saying I wanted to help with the work and giving her the flight, time and day of my Calcutta arrival. Father Bill Petrie’s life path began with being inspired by St. Damien. It led to priesthood, and 25 years working with the poor and Hanson’s disease patients in India with Mother Teresa. We became friends the first moment we met. The chemistry between us created a bond and new beginning that would last 25 years, from 1975 to 2000. Mother Teresa explained that she never received my letters or the donation, but it didn’t make any difference. I made this journey to the unknown in faith, and there was a place for me in the Hansen’s disease work. Another phase of my life was beginning. I was to realize that closure must be followed by a neutral time of reflection and preparation for a new beginning. I had worked in a loved-filled parish setting for several years, and leaving it was difficult for both the people in my life and me. That was closure. The old expression, “love is being able to let go,” won out. Then a neutral time followed when I spent almost a year preparing, obtaining more medical knowledge and learning rehabilitation skills. Then I remember it well — June 29, 1975, at 33 years old — my new beginning started. I can compare the experience to the date of a graduation or marriage. Learning to cherish the dates of new beginnings starts with your remembering your birthday. And remembering the first day of a new adventure develops a sense of gratitude. Being grateful is the very foundation of obtaining happiness. Seeing both the good and the bad learning opportunities, accepting what life brings, and letting go of negative aspects allows us to be ready to move on. Taking things as they come or as they are “given” brings ongoing satisfaction with yourself and all your daily activities. Reading books about St. Damien eventually allowed me to see Damien as a role model for my life. I learned about the people who supported his work, Franciscan sister Saint Marianne Cope, who spent over thirty years at Kalaupapa and Joseph Dutton, a layman who worked in Kalaupapa for forty-two years. That these people freely and willingly embraced serving people rejected by the world, gave me a sense of awe. What made them do it, in those days, when there was little understanding of Hansen’s disease or its transmission. 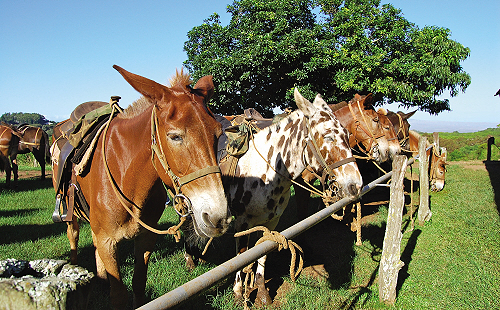 My association with Blessed Mother Teresa gave me insights into their Moloka‘i beginnings. I had experienced some of the hope and tender joy that sustained them, brought them happiness, complete fulfillment and daily work satisfaction. Mother Teresa told me that the most important part of helping the suffering is to “be there.” Saint Damien, Saint Marianne, and Joseph Dutton were experts at “being there.” This lesson could be applied by any faith-filled person and especially by caregivers who might be reading this article. After three years working at one of Blessed Mother Teresa’s Hansen’s disease Rehabilitation Centers, I was assigned to assist her missionary sisters in another location to help construct another rehab facility. The Catholic Church in that area had an “Archdiocesan Leprosy Office.” At my request, the Bishop changed the name to a “Human Life Center” for promoting personal, interpersonal and community growth, based on the prayer of Jesus, who asked God that we “would have life abundantly.” The life that Blessed Mother Teresa was living and imparting was exactly that — abundant life, full of productive faith, hope and dignity. I think abundant life is also what Damien, Marianne and Joseph Dutton were able to help the patients of Kalaupapa achieve. The Moloka‘i trio was successful despite the isolation of Kalaupapa and Kalawao. With limited resources and support, they offered the patients many new beginnings. 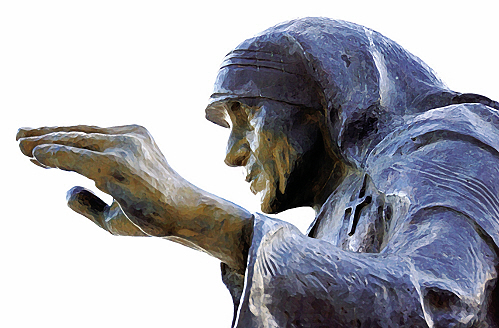 With modern communications and the jet age, Blessed Mother Teresa exercised her faith and shared the abundant spiritual life in over 120 countries around the world. Damien, Marianne and Dutton inspired me, but it was my association with Blessed Mother Teresa that empowered me to share Damien’s vision with others and continue his work. “Significant others,” has nothing to do with having a special partner. Rather it is recognition of what has happened in my life because of their inspiration. Blessed Mother Teresa and Saint Damien were significant others for me and countless people. Anyone who accepts them as role models, gets energized. There is a quality that all people have in varying degrees. I call it “sacred presence.” I experienced it when working in India. Blessed Mother’s mobile clinic distributed medicine once a week. One week there were no medical supplies, so the clinic didn’t take place. The following week when the medicines arrived, one of the patients asked Mother Teresa where she was last week. She responded that they didn’t come because there were no medicines. The patient replied that it didn’t make any difference if there were no medicine — she should have come anyway. Wow! What a powerful lesson that was for me. Distribution of medicine, food or clothing was not as important as the presence of Mother Teresa herself. That’s when the concept of sacred presence became a reality for me. In some ways, we are all practicing it when we attend a wake of a deceased person. We don’t need to be concerned about what we will say to the bereaved family because just being present affirms and uplifts those in mourning. Sacred presence is the best gift we can bring to a wedding, a graduation, or a reunion. When individuals are filled with God’s love, they have a spiritual empowerment, which radiates to others. 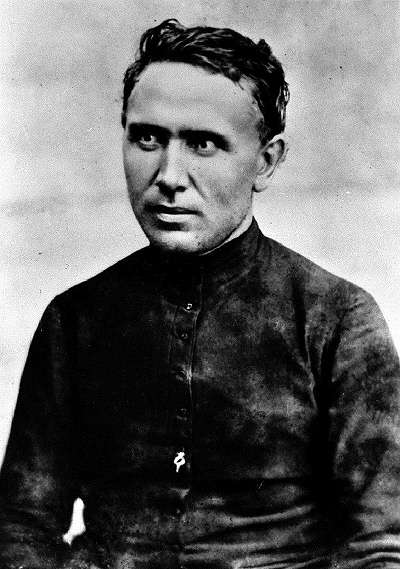 My understanding of Saint Damien is conveyed to me by some insights Mother Teresa taught her volunteers. She would tell them that it’s not how much you give, but the love you put into the giving. When gathering with other people, make sure everyone leaves a happier and better person. Smiling at someone is an action of love, a gift to that person. Small gestures exercise and strengthen the sacred presence that surrounds us when we love God and our neighbor. Despite all that Damien had to endure, we marvel at his sacred presence when he wrote that he was the happiest missionary in the world! His spiritual joy enriched everyone who was around him. He confessed that he received his strength kneeling at the altar, in prayer. Don’t we all need a daily silent and prayerful time? A rich celebrity once admitted to Mother Teresa that he felt guilty in her presence because of the great work she did for the poor. He was comparing his life to hers and felt that he fell a little short. Her simple answer was stunning — she didn’t tell him to change his ways. she encouraged him to be holy in his life, just as she was called to be holy in her life. Her response consoled and energized him. Mother Teresa was inspiring him with her presence and encouraging him to live abundantly. The word “sacred” is derived from the Latin word sacre, which means restricted or set apart. An extraordinary person, place or object can be designated as sacred, and may seem to have a different reality from natural or normal things. The sacred is always connected with divinity and religion. One of the oldest sacred places on earth is the Holy Land, visited for millennia by pilgrims and tourists. In Asia, people visit the sacred Taoist and Buddhist mountains. The tourist travels on a vacation; the pilgrim journeys as a purposeful spiritual act. There are many sacred places in the world connected to the sacred presence of an individual. 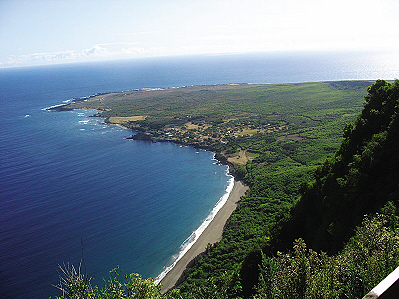 A pilgrimage to Kalaupapa/Kalawao on the island of Moloka‘i can be a very memorable vacation, a peaceful retreat for making life decisions, or even a new beginning. Over eight thousand Hansen’s disease patients lived and died on this sacred land. Hundreds of dedicated workers and medical personnel lived at Kalaupapa/ Kalawao, often at great sacrifice. For Catholics, the lives of Saint Damien and Saint Marianne are a source of inspiration. The Latter Day Saints, Protestant churches and Buddhists all have a history of committed individuals in ministry here. By making a pilgrimage to Kalaupapa, you learn the historical context for the canonized saints and countless other holy people who died here. A view to Kalaupapa pier from the courtyard of St. Francis Catholic Church. Photo courtesy of Father Pat. An ancient disease described in Bible was called “leprosy” in English, after the Latin, lepra, meaning “scaly.” Today we call it Hansen’s disease, named for Dr. Gerhard Henrik Armauer Hansen, a Norwegian physician who identified the bacterium that causes the disease, Mycobacterium leprae. Hansen’s disease is transmitted among humans the same way we pass on colds. In the past 20 years, modern antibiotics have cured over 200 million cases of Hansen’s disease worldwide. 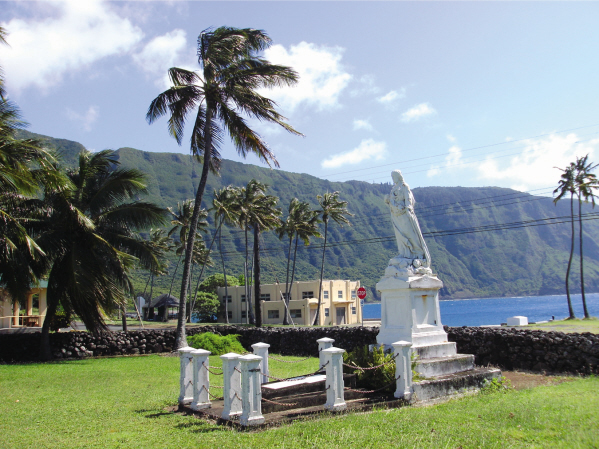 Unless a patient or worker personally invites you to visit Kalaupapa, the only way to tour the settlement is on an approved four-hour Damien Tours and arranged access via Makani Kai airlines or Kalaupapa Mule Tour. The mule train descends a path down a majestic 1800-foot cliff that separates Kalaupapa from the rest of Moloka‘i Island. The success of a spiritual journey to a sacred destination always depends on the individual. 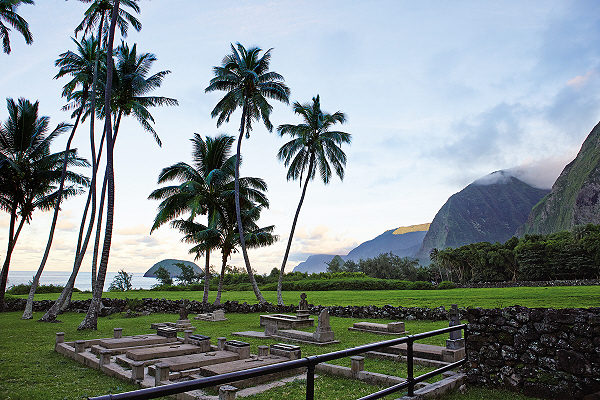 When you visit Kalaupapa, I recommend taking time for silent reflections at each special site Damien Tours visits. Breathtaking views of huge cliffs we call the “Pali” and the rock-bound coast that isolate Kalaupapa from the rest of the world end with the arrival of your nine-passenger plane at Kalaupapa landing strip, one of the few USA airports without TSA equipment and security personnel. The open-air pavilion, a picnic area for residents, echoes bygone days of trust and goodness. 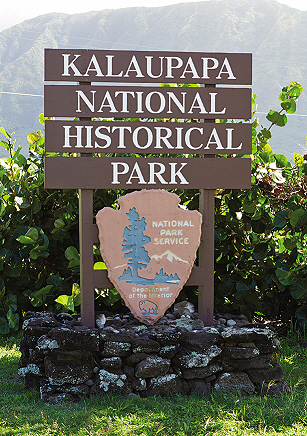 Your tour guide, the driver of an old school bus, awaits at the Kalaupapa welcome sign. 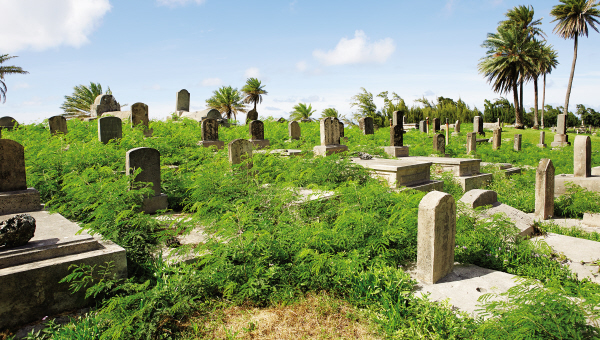 On the road to the settlement, Papaloa Cemetery is the first reminder of the eight thousand plus patients who died here. So many graves on a little spit of land make us reflect upon our own death and funeral. Saint Damien and Mother Marianne saw funerals as celebrations and liberation from the burdens of life to a new heavenly life — another new beginning. Next, the bus passes the Mormon Church, a reminder that Hansen’s disease was without boundaries. The driver points out the Kalaupapa pier, and we try to imagine steamers mooring offshore and small rowboats bringing patients ashore. Damien always came to welcome the saddened newcomers. Many were overcome with grief, knowing they could never return home to their loved ones. Exile was permanent. The bus stops briefly at St. Francis Catholic Church, where a Congregation of the Sacred Hearts priest celebrates Mass every morning. Nearby stands the Congregational church. These three churches are a reminder that faith in God gave generations of patients strength, hope and meaning to their lives. Only the convent and St. Elizabeth Chapel remain on the spacious land that once housed and ministered to hundreds of girls and women, giving them love, care, protection and dignity. The Bishop family supported a home for girls where St. Marianne and the Franciscan Sisters ministered to single females and young girls, some of whom were orphans. On ruins of a former hospital destroyed by fire is a new clinic where a medical staff attends to several patients and workers still living in the settlement. Another vacant parcel of land marks the site of the Baldwin Home for boys and men. Volunteer Joseph Dutton and the Sacred Hearts Brothers were the caretakers for the men. A view of St. Philomena Catholic Church from the south, across open fields of unmarked and marked gravesites. Next, the bus drives by former patient homes and the visitors’ reception center. The patients’ cafeteria is still used every day, and a former movie hall is used for holiday celebrations during the year. The bus turns left on Damien Road, which leads to Kalawao where the original settlement was established. The first structure seen is the Siloama Church, constructed by the patients one year after arriving in 1866. A boundary wall separates the compound where St. Damien lived and constructed the Saint Philomena Catholic Church. Beside the church are the original graves of St. Damien and Joseph Dutton. The sacred land surrounding the church holds over one thousand unmarked graves. A memorial will be constructed to remember the names of all the 8,000 or more patients who died in Kalaupapa and Kalawao.This is very sacred ground; peace and quiet envelop you. Take time to quietly sit, meditate or pray. Across the road are the remains of the original home for boys and girls, before the settlement moved to Kalaupapa. Old photographs are helping the National Park Service renovate the landscape as Kalawao looked over a century ago. Deep silence, broken only by wind and surf, draws every tourist or pilgrim inward. They have personal thoughts about the sorrow and pain endured by the Hansen’s disease patients who lived here. Kalaupapa calls us to reflect — it is a memorial to closure, extended quiet, neutral time of preparation, and accepting new beginnings. The road continues. Today, National Park Service workers are preparing Kalaupapa and Kalawao for the time when there are no more Hansen’s patients living here. The settlement will be preserved and managed as a national historic park. I am privileged to be the Pastor of St. Damien in Kaunakakai, and to be able to assist residents and workers in Kalaupapa as they transition. I minister to my congregation in the tradition of St. Damien and St. Marianne, with the training of Mother Teresa. I, too, am a happy missionary. Like my special “others,” I look forward, with joy and gratitude, to more new beginnings. For the adventurous, a Damien Tour begins with a mule ride on a switchback trail descending 1800 feet. Honey, Will You Sign Me Up for Smart911?